How is the LAWPRO Risk Management Credit different from the Law Society CPD requirements? The Risk Management Credit is distinct from the Law Society’s mandatory CPD requirements. While a CPD program may qualify toward the Law Society’s hourly requirements, it will not necessarily also qualify for the LAWPRO Risk Management Credit. Which CPD providers’ programs qualify for the credit? 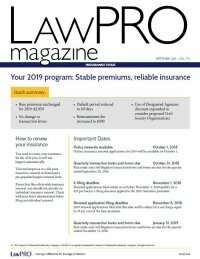 LAWPRO works closely with the Law Society, the Ontario Bar Association, the Canadian Bar Association, Federation of Ontario Law Associations (FOLA), The Advocates’ Society, Osgoode Professional Developments and other not-for-profit CPD providers to create programs that qualify for the LAWPRO Risk Management Credit. CPD programs offered internally by LAW FIRMS (for firm LAWYERS and/or clients) may also qualify for the Credit, provided they meet all other eligibility requirements. Why does the course I attended not appear on the approved list of courses? The CPD provider may not have submitted the program for approval or it may not have met our criteria to qualify for the Credit. I attended an approved CPD program while articling, and have now been called to the Bar. Can I claim a credit for a program I attended before I was called? Yes, you may claim the credit as long as the approved program you attended AND your call date was prior to the September 15 deadline to claim for the following policy year. Can I claim the credit if I participate in an approved program via a live webcast online replay? You can claim the credit for participating in an approved program via a live webcast or online replay, provided you watch the entire program and have a copy of the program materials. For replays, on the CPD declaration form you should claim credit for a video replay of an approved CPD program. We only keep a list of approved programs from the current CPD year. To tell if an older program was approved look for the LAWPRO Risk Management Credit logo in the materials. How can I claim the credit for an approved CPD program at my firm that isn’t specifically listed? If the internal CPD program at your firm was approved for the credit, you can select LAWPRO-approved firm CPD presentation on the declaration form. What is the deadline to complete the Risk Management Credit Declaration? For the Risk Management Credit to be applied to your premium, the online CPD Declaration must be completed no later than September 15. This allows LAWPRO to apply the Credit as part of your policy renewal beginning in October. Can I apply the Risk Management Credit to my Run-off or Excess policy premiums? No, the credit can only be applied to the standard policy premium. If the completion of a Homewood e-Learning course qualifies for a $50 credit, can I complete two e-Learning courses to qualify for a $100 Risk Management Credit? No, the maximum premium Credit for completing the e-Learning course is $50. If I have any further questions regarding the Homewood e-Learning courses offered by the Law Society’s Member Assistance Plan, whom should I contact? You may contact Homewood Health at 1-855-403-8922.